WTI crude prices are in the $49.25-$49.50/b range this morning. WTI opened at $49.93/b today, a significant recovery of $1.18, or 2.42%, above Friday’s opening price. 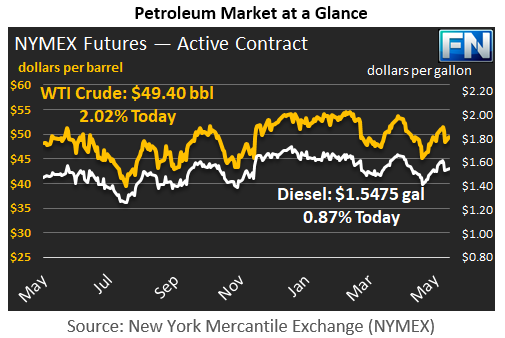 Current prices are $49.40/b, back down by $0.40 below Friday’s closing price. Diesel opened at $1.5621/gallon this morning. This was a recovery of 1.5 cents (0.97%) above Friday’s opening price. Current prices are $1.5475/gallon, down by 1.58 cents from Friday’s closing price. Gasoline opened at $1.6416/gallon today, a recovery of 3.11 cents, or 1.93%, from yesterday’s opening. Prices are $1.6275/gallon currently, down 1.51 cents from Friday’s close. Crude and product prices plunged following the OPEC meeting in Vienna on Thursday, despite the fact that OPEC agreed to make the nine-month extension to the production cut agreement. Friday brought additional buying interest ahead of the Memorial Day weekend, and prices began to recover. 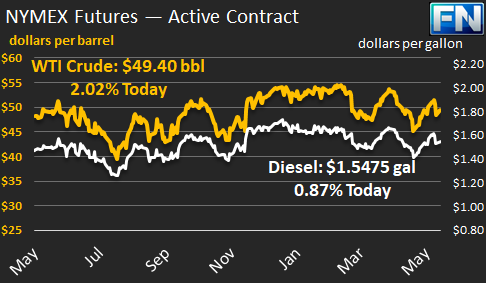 Crude, gasoline, and diesel all ended in the red for the week, however, and prices this morning have weakened. Baker Hughes released the weekly oil and gas rig count on Friday, reporting an addition of seven rigs. The rig count has increased in 20 of the 21 weeks so far this year, adding 243 rigs and bringing the total rig count for 908 for the week ended May 26th. This is the highest rig count since the week ended April 24th, 2015, approximately twenty-five months ago. Because of Memorial Day observance, gasoline and diesel retail prices will be published a day late. Today, our second article is part 2 of our feature on Mexico, focusing on Mexican fuel production and rising imports from the United States.